We all know the potential risks of unhealthy food and drinks, and try to avoid them as much as we can. We try not to consume sugary, fatty, salty food, and increase the consumption of foods, vegetables, water, and so on. Most of the people think that 2 liters of water a day and consumption of healthy food is totally safe for their health. But, most of them are not aware of the substances which can be found in the plastic containers. Most of the food producers don’t care about the nutrients of the food or drinks they produce. Therefore, you should pay attention yourself to what is written at the bottom of the plastic bottles in order to see how dangerous it is. Here is a list of the things and their properties. This kind of plastic is the less damaging one because the chances of it to emit chemicals into the water are lowest, or it doesn’t emit chemicals at all. Actually it is not used for making bottles, only for plastic bags. This plastic emits STYRENE into the water. Styrene is a cancer-causing substance. Coffee cups and food packagings are made from this plastic. Besides emitting cancer-causing substances, bottles made of this plastic can happen to emit heavy metals antimony and EPA chemical substances as well. This plastic can damage the function of the hormons. The worst chemical, called BPA, is emitted by this plastic. 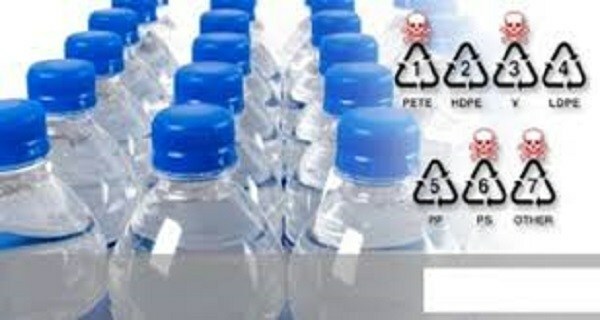 Sports bottles, food storage containers, and even bottles for infants are made of this plastic. It releases 2 kinds of toxic chemicals which can interrupt the hormone function in human organism. Unluckily, this is the most commonly used plastic for making bottles. Another harmful plastic with white color. It is used for plastic bottles for storing yoghurt or milk. In conclusion, the first two and the last two substances on the list are the safest plastics which don’t emit chemicals into the water. Pay attention to the rest of them and make sure you avoid them as much as possible. The best option would be to store water in glass bottles.